The adverse events associated with climate change cause damage to people and ecosystems, cost millions in damage, and disrupt business. And businesses have a large part in greenhouse gas emissions. This is why disclosure on ESG issues has become a must for investors to best assess impacts and risks, and for companies to take action to mitigate them. More importantly, more transparency can also help companies identify opportunities, and contribute to securing capital and a more diverse investor base. GRI as part of the Technical Expert Group on Sustainable Finance (TEG) is proud to support the report, which can be found here. The report contains proposals for disclosing not just how climate change might influence the performance of a company, but also the impact of the company itself on climate change. 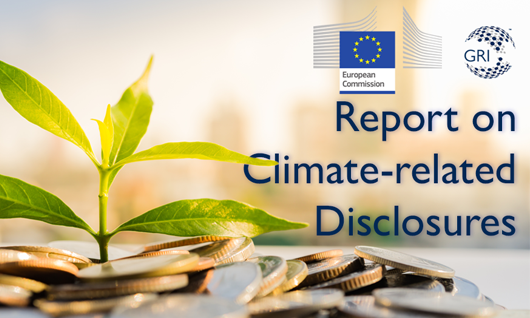 The report represents another step forward in the implementation of the EU Sustainable Finance Action Plan that the Commission published in March 2018 and follows up on the Commission's legislative proposal on the disclosure of climate-related information presented in May 2018. The Action Plan sets out a comprehensive strategy “to further connect finance with sustainability”. This report serves as input to the Commission for the update of the Non-Binding Guidelines on non-financial reporting with specific reference to climate-related information, in line with the recommendations of the Task Force on Climate-related Financial Disclosures (TCFD) established by the Financial Stability Board, and with the Commission’s proposal on a 'taxonomy' of sustainable economic activities. There will be a consultation by the European Commission on the draft update of the Non-Binding Guidelines in the coming weeks, supporting the implementation of the Non-Financial Reporting Directive (NFRD). To better understand how the GRI Standards and the NFRD are related, please take a look at the Linkage Document. While GRI has been primarily active in the Technical Expert Group on climate-related disclosures, there are three other work streams that support the EU Action Plan on sustainable finance. These work streams are on taxonomy, which will establish technical screening criteria for environmentally sustainable economic activities, on the EU Green Bond Standard, and on benchmarks, establishing minimum standards for the methodology of "low carbon" and "positive carbon impact" indices as well as minimum disclosure requirements for ESG benchmarks. More information on these workstreams can be found here. Keep up with the latest sustainability reporting news by subscribing to our newsletter.